Sonnenburg Builders has been serving the towns, villages and cities of Manitowoc County since 1986. We’ve earned the trust of homeowners from Cato to Cleveland and Kellnersville to Kiel. Our hard work and dedication to staying on time and within budget, without ever sacrificing the quality of our work, has paid off with an A+ rating from the Better Business Bureau. We’re Manitowoc’s first choice for bathroom remodeling. Talk to us today for a free estimate for your new kitchen or bathroom renovation project. Sonnenburg Builders is happy to provide independence for the growing number of seniors aging in place in their own homes, as well as people suffering from permanent injuries and disabilities which may limit their mobility and range of motion. 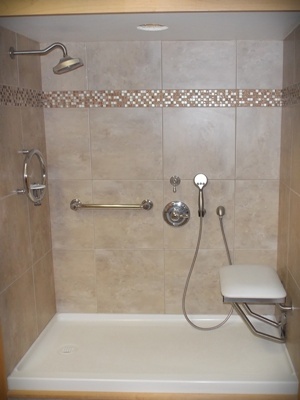 We install walk-in showers, built flush to the floor, including seats, grab bars and safety rails to ensure both your safety and privacy remain entirely within your control. Come into our showroom to see the bathtub with the swinging door built into it, and discuss why this may or may not be the best option for your bathroom remodeling project. You have remodeling ideas for your home kitchen and bath. You also have a lot of questions to ask. Your first question to us will probably be, “How much will it cost?” At Sonnenburg Builders our goal is to bring you the design and style you want, while staying within your budget. We’re not going to short-change you on quality just to trim expenses. We’ll give you an accurate quote and control our costs, so you won’t be suffering any contractor nightmares from half-finished jobs and cost overruns. Ask our customers; they’ll tell you when you work with Sonnenburg, you’re working with a straight-shooter. Sometimes you just need a handyman to tackle the jobs you don’t have the time or the confidence to do yourself. Never fear, Manitowoc Handyman is here for all your household odd jobs and rental property maintenance. We’ll wash your windows, repair your window frames or cracked glass, unclog your plugged drains or toilet, or fix or replace your old appliances. We’ll even patch or replace damaged drywall. Sonnenburg Builders has been at the service of Manitowoc County families for more than 30 years. Give us a call for all of your household projects, no matter how big or small.